120,000 polling locations are inventoried and spatially located. System helps ensure free and fair elections in Nigeria. GIS is used for map production and redistricting. The project was carried out in three phases: development of the data collection application, field data collection and editing, and development of the Polling Unit GIS application. Nigeria, one-third larger than Texas in area and the most populous country in Africa, is located on the Gulf of Guinea in West Africa. It is bordered by Niger and Chad to the north, Cameroon to the east, and Benin to the west. 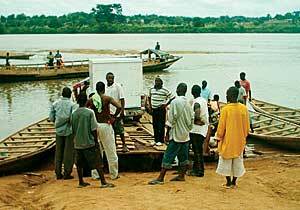 The lower course of the Niger River flows south through the western part of the country into the Gulf of Guinea. Swamps and mangrove forests border the southern coast, while inland are hardwood forests. The Independent National Electoral Commission (INEC) is a nonpartisan Nigerian government agency charged with the conduct and supervision of elections. In the late 1990s, the agency began modernizing its information technology infrastructure by migrating from an outdated legacy voting system heavily dependent on inaccurate paper records and polling cards to the newer Electronic Voting System (EVS). At the heart of EVS is the Electronic Voter Register (EVR), which, by capturing the names of all eligible voters, eliminates duplication and thereby minimizes discrepancies in the electoral process. As such, EVR is viewed as a means of ensuring free and fair elections in Nigeria. As part of the modernization process, INEC needed to inventory and spatially locate the agency's 120,000 polling locations scattered around the country. These locations and their attributes needed to be linked to EVR. GIS technology was identified as a potential solution to the problem, and TTi Limited (formerly Adorbel Ltd.)a consultant responsible for the field data collection and project management for INECsubcontracted to Esri Business Partner Geo-Imaging Consulting of Washington, D.C., to design and implement a Polling Unit (PU) GIS. Geo-Imaging proposed integrating GPS, digital photography, and DBMS technologies to create a data collection tool capable of capturing the x,y locations and images of existing polling units. Since the client's budget constraints precluded the purchase of COTS GIS software, the use of an industry-standard development environment to create an application with GIS/mapping capabilities was also proposed. The application would then be linked to EVR. The data collection equipment comprised 40 Dell laptops, Trimble Navigation GPS units, USB drives, and digital cameras. Each laptop was preloaded with a Microsoft Access database containing polling unit information from EVR. Using Trimble Software Development Kit, the GPS unit was customized to interface with the Microsoft Access application, allowing for the capture of each polling unit's x,y location and image directly into the Access database. For the data collection exercise, the country was divided into four zones, each with a team of 10 trained field data collectors. At the end of each data collection day, USB drives were used to transfer data from the field laptops to servers in each zone's headquarters, after which the data was periodically transferred to the nation's capital, Abuja. Every week, the Abuja data was consolidated and transferred to Geo-Imaging's Washington, D.C., office where ArcGIS Desktop was used to convert and edit it. Mock registration areas (proposed third-level administrative boundaries) were digitized based on certain attributes of the polling unit data. 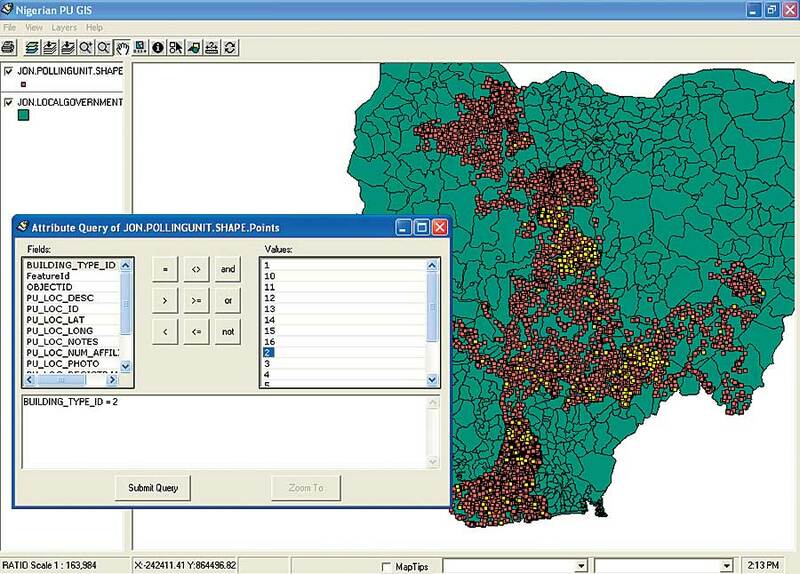 The PU GIS, a MapObjects software-based application developed using Visual Basic, displayed polling unit locations within two levels of administrative boundaries (state and local government areas) and the proposed registration areas. Apart from displaying data, the application also displays a given polling unit's image when it is identified. Users can also create simple GIS queries using the application, which is a client to an ArcSDE 9.2/Oracle DBMS. During the course of the project, INEC commissioners visited Washington, D.C., for PU GIS end user training, as well as introductory GIS courses from Esri. The final training session was carried out in Abuja after the testing and acceptance of the application. The audience at this session comprised largely the proposed end users. 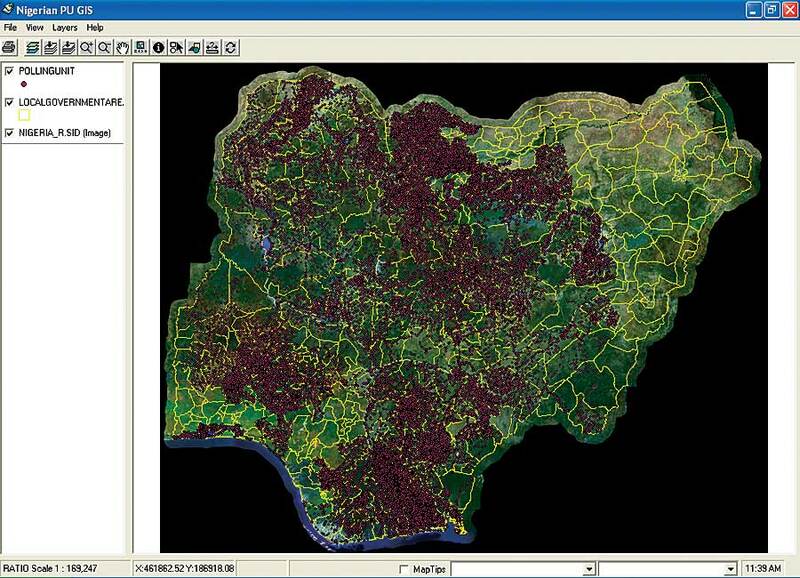 Nigeria's Information and Communications Technology (ICT) Department established a well-equipped GIS lab on INEC's LAN and now uses PU GIS for departmental map production and future administrative boundaries redistricting decision support. The application is also used to generate reports and carry out analysis on voter distribution. ICT offers day-to-day support for end users of the application. For more information, contact Tunji Adeshina, former ICT chief (e-mail: tjadeshina@yahoo.com, tel. : 234-9-41331850); Johnson Asinugo, president and CEO, TTi Limited (e-mail: johnson@ttilimited.com); or Geo-Imaging Consulting (tel. : 202-408-0003, e-mail: info@geo-imaging.com, Web: www.geo-imaging.com).